On Friday I bought some Strawberry Philly (Philadelphia cream cheese) to try and because sales of it support Breast Cancer research…I came up with the idea to make pink velvet cupcakes with the Strawberry Philly (in place of the cream cheese) icing. Add the butter and sugar to an electric mixer (or using a handheld mixer) and cream together for 7 minutes, or until light and fluffy. 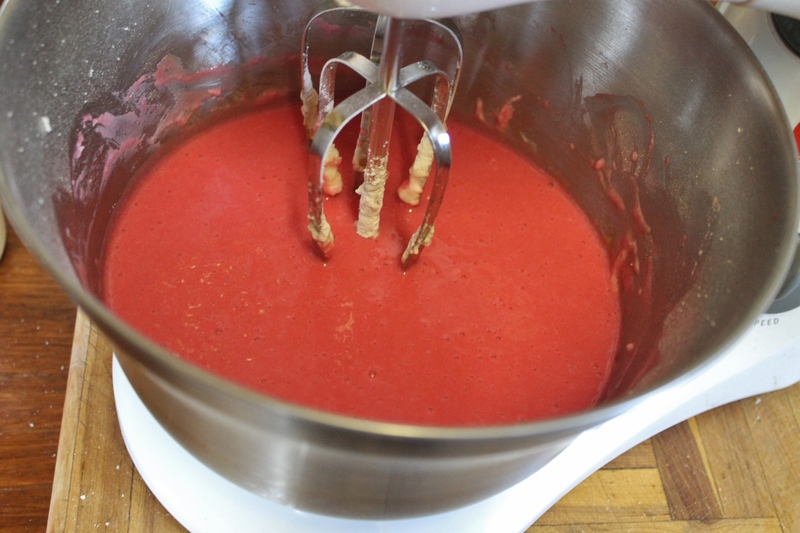 Mix the *Strawberry Nessquick and food colouring together in a separate bowl to make a paste, then add it to the mixer and mix until incorporated. Add the flour and buttermilk and mix for 2 minutes. Then add the baking powder and white wine vinegar and mix for a further 2 minutes. Divide evenly between the muffin cases. Bake for 20-25 minutes or until a skewer comes out clean. Remove the baked cupcakes from the oven and immediately transfer to a wire wrack to cool completely. Cream the butter and Strawberry Philly cream cheese together in the mixer for 2 minutes. Add the icing sugar and beat for about 2 minutes until smooth. Once the cupcakes are completely cool, spread the icing over the top of each one with a knife. Strawberry Philly cream cheese is only available during October (for breast cancer awareness month), so you could use regular cream cheese with strawberry flavouring, if you'd like. Don't be afraid to use the white wine vinegar, it reacts with the baking powder and makes the batter light and fluffy. You won't even know it's there, once the cupcakes are baked. There are many different variations of red velvet recipes are around and all would be able to be adapted into pink velvet cupcakes. I used the Red Velvet recipe in the Love bakery cook book. Loved the look of the pink cupcake batter! I used Queen Pink natural colour. Fun Fact: Cochineal comes from the Cochineal insect (sorry if this grosses you out! ), it has and sometimes is still used in cosmetics too! 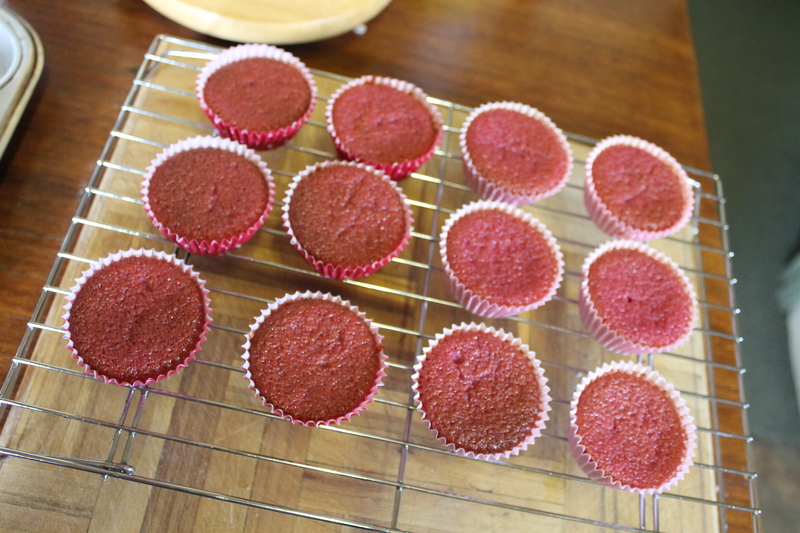 The most perfect uniform cupcakes, that I’ve ever baked!…too bad I left them in the oven a little too long! The Strawberry Philly is really yummy! It almost has this strawberry ‘yoghurt’ taste to it. I also have some of the mini tubs, I think I might use some on some croissants. 50c from each tub or mini tubs of Strawberry Philly goes to the NBCF and Cancer research. You could bake these Pink velvet cupcakes for your own pink ribbon breakfast, girls night in or just to enjoy at home! Raising money for Breast Cancer research is a good reason to bake some yummy (and girly) cupcakes! This entry was posted in Causes and tagged baking, Breast cancer awareness, NBCF, Pink ribbon, pink velvet cupcakes, Strawberry Philly by cottoncandydiva. Bookmark the permalink. Oh my gosh these look AMAZING! 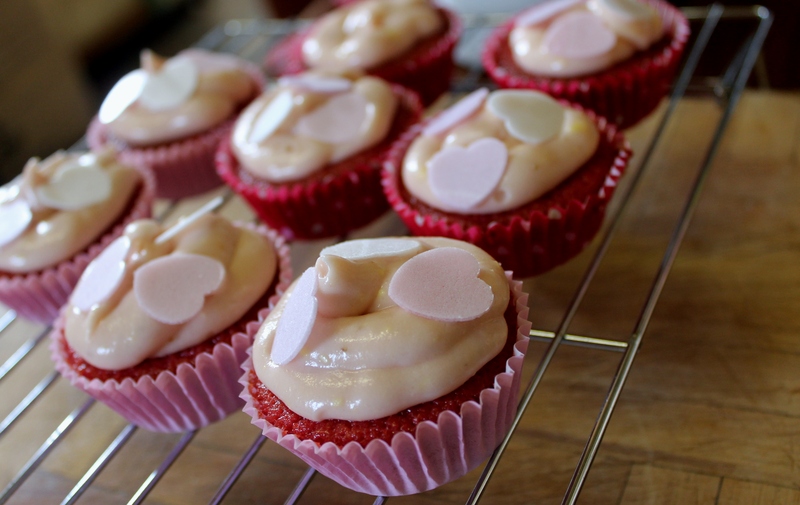 And what a fab idea using the Strawberry Philly as icing… YUMMMM! Must try this! Thank you! I wasn’t sure if I’d like it (the strawberry flavour), but it surprised me!